Matthews Roofing specializes in commercial and industrial roof coatings that can prolong the life of your Chicagoland roofing system. 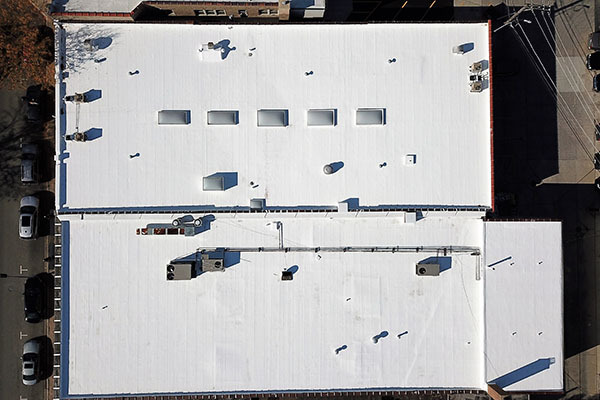 Industrial Commercial Roof coatings provide protection to any Chicagoland commercial or industrial roof and decrease the need for roof replacement. An industrial commercial roof coating is a monolithic, fully adhered, fluid applied roofing top surfacing. It has some elastic properties that allow it to remain flexible with Chicagoland temperature changes. Typical industrial commercial roof coatings range from 3 mils to 40 mils thick depending on specifications. The roof coating actually becomes the top layer of protection for the underlying membrane, receiving the impact of infrared and ultraviolet sunlight, rain, hail and physical damage. Industrial commercial roof coatings and cements are available with a wide range of properties and consistencies to fit a multitude of purposes. Low viscosity, non-fibered coatings are formulated as penetrating primers and damp proofing coatings. Medium viscosity, fibered and non-fibered coatings and cements are formulated as interply adhesives and top coatings for use on commercial, industrial, and residential roofs. Some of these coatings incorporate pigments (aluminum, titanium dioxide and others) to reflect the damaging rays of the sun, creating a longer performing and more energy-efficient roof. High viscosity, heavy bodied cements are designed for adhering waterproofing membranes and components, and for patching and repairing leaks. Industrial Commercial Roof Coatings are seamless when they are installed correctly and can add years of life to your Chicagoland roof. “Cool Roofs,” using white elastomeric roof coatings to reflect heat and light away from the roof, provide huge financial benefits in reducing air conditioning costs and equipment wear. Now, the Federal government has created tax incentives for energy-saving improvements, including cool roof coatings. Many states are now offering incentives to contractors and homeowners who use cool roof coatings, so you’ll receive another benefit for choosing one of the most effective Chicagoland roof coatings available today.